Let us cater your next event with Katies favorites. Contact us for details. There´s So Much to See and Do In Lancaster County! Sight and Sound Bible-based live theater. Strasburg Railroad Heritage railroad takes visitors on a 45 ride through Lancaster County farmland. Railroad Museum of Pennsylvania Features more than 100 historic locomotives and railroad cars. The Strasburg Village Inn A lovely B&B on the square in historic Strasburg. Village Greens Miniature Golf Miniature golf on 13 country acres. Amish Village Tour of an authentic Amish farmhouse and grounds. Farm Folk Bed and Breakfast An authentic B&B on a 125-acre farm. Just wanted to compliment you on a wonderful restaurant. Silvia was an excellent host, my family and I really enjoyed the meal. God Bless you all. We serve a wide variety of Breakfast, Lunch and Dinner entrees, including many Pennsylvania Dutch favorites, for dine-in and take-out. In addition, we offer homemade Amish desserts and soft-serve ice cream. All menu items are available for take out. Come visit us to enjoy some real Lancaster County Amish cooking! 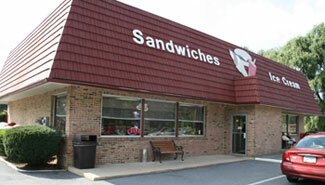 We've been proudly serving the fine folks of Lancaster County for six years!